IAS Products Ltd. presents our high intensity output 110-volt and 230-volt AC model 50/60 Hz operating SeeBrite™ LED Aquaculture Lights. These LED lights are manufactured using IAS proprietary designed CSA/UL and CE certified LED circuit boards assembled within two (2) standard model-housing sizes. Our unique LED circuit board designs offer the modular building block approach necessary to address specific customer lighting needs. Take advantage of IAS ability to manufacture either model SeeBrite™ LED Aquaculture Light to address changes required to physical light sizes, light outputs, and light operating frequencies for best photo maturation and control. Choose the best operating voltage, LED type, brightness, and the quantity of LEDs within a tough underwater fixture to address all your site applications. Whether it is a stock LED light model or a specific product build, every model SeeBrite™ LED Aquaculture Light is provided with an onboard circuit board positioned microprocessor that expands IAS ability to set and control light output operating characteristics. Brighter, dimmer, strobe, random flash or slow ramp up to full brightness are all available control features IAS can incorporate into the light. As a starting point IAS offers a 2-minute ramp up to full brightness to avoid sudden shock or stress to fish when SeeBrite™ LED underwater lights are powered up. Beyond these light control features, our capability to build customer specific SeeBrite™ LED underwater lights is based on our modular building block approach. Two different circuit boards designed for 110-volt AC and 230-volt AC line voltages. No matter which series of SeeBrite™ LED underwater light is chosen, all underwater lighting products have the ability to operate either 50 or 60 Hz with a voltage tolerance of +/- 10% ensuring SeeBrite™ LED lights perform equally well in tough site operating situations where generator power is the norm. While IAS focuses on using industry leading Cree® LEDs our lighting engineers and technologists access all LED manufacturers to find the best light output combination to address specific spectral light distribution curves and intensities for best maturation control and growth. By simply changing the solder pads on the circuit boards we can offer the most common 425-485 nanometer ‘Royal Blue and 500-550 ‘Blue-Green’ wavelengths as well as full spectrum, ultra violet and infra red lighting wavelengths for underwater cameras monitoring. SeeBrite™ Product certification has included the ability to change circuit board LED driver outputs from as high as 500 milliamps to as low as 325 milliamps to provide IAS with the tools necessary to adjust LED brightness levels. This current control ability determines how ‘hard’ the LEDs are driven within the underwater housing. The highest milliamp rating equates to a 24/7 operating life of approximately 70,000 hours (8 years) with the lowest milliamp rating offering a 24/7 operating life of 100,000 hours (11.5 years). In either case low maintenance operation is assured with no need to enter the underwater housing to replace lamps and no opportunity for improper reassembly and fixture flooding. And for optimum versatility each SeeBrite™ LED circuit board may be operated singularly or collectively in groups of up to eight circuit boards within any number of underwater housing designs. Not only can IAS adjust output intensity, but also by adding circuit board modules IAS can balance light size with underwater light operating longevity. SeeBrite™ LED Aquaculture Lighting is certified to operate with two PUR jacketed underwater cable types, representing the two conductor wire gauges for the 110 vac and 230 vac power requirements. Given the exceeding low operating current required, typically in the 0.35 to 2.5 amperage range per SeeBrite™ LED light fixture, cable runs of up to 50 meters/165 feet are easily addressed. Underwater housings are manufactured in Lexan® and Delrin® two extreme duty materials ideally suited for long-term light fixture submersion. Lexan® has been chosen to meet UL/CSA requirements and to eliminate the problem of glass dome breakage that occurs during site handling or operation. All Lexan® housings are provided with molecularly bonded Hardcoat® to protect the light’s face from scratching. 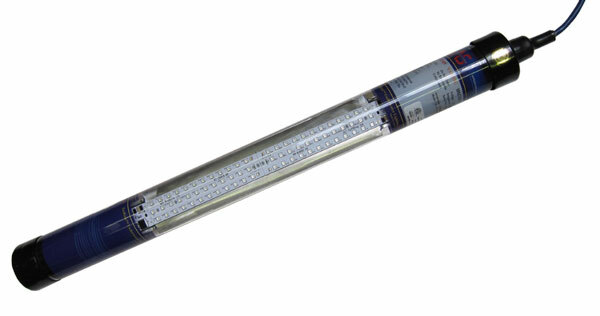 With all these design tools at hand IAS Products Ltd manufactures and offers SeeBrite™ LED lighting for hatchery tank applications and small grow out and large sea cage based applications. So whether you chose to use smaller SeeBrite™ LED lights spread throughout the cage or just one or two large SeeBrite™LED lights to reduce infrastructure costs – IAS Products Ltd has your lighting needs covered. All SeeBrite™ LED light source can be programmed to strobe, random flash, or ‘ramp up’ to full brightness when required for low stress ‘lights on’ applications’. Manufactured with clear Lexan® housings with molecularly bonded Hardcoat® anti-scratch surface protection for a long life operating fixture. Remote controller allows single or grouped SeeBrite™ LED lights to be dimmed to any output level. Range of circuit board combinations and circuit board positioning inside underwater housing to create best light source for site application. Both 110 vac and 230 vac will work within +/- 15% volts making SeeBrite™ LED lights ideal for remote generator powered site applications. Range of housing sizes to match both small and large site requirements. All LED lights operate 50/60 Hz. for simple site installation anywhere in the world. Save energy by using LEDs designed to radiate light further in water at the lowest practical power levels. 100-watt LED = 400-watt metal halide. LED circuit boards will accept any number of surface mount LEDs. Light weight, compact size ensures safe and easy site handling and best light positioning. Select specific or blended nanometer operating outputs to best match lighting to maturation control and growth. Eliminate costly down time, maintenance labour, and improper re-assembly and fixture flooding.